In this article we will briefly study what linear regression is and how it can be implemented using the Python Scikit-Learn library, which is one of the most popular machine learning libraries for Python. The term "linearity" in algebra refers to a linear relationship between two or more variables. If we draw this relationship in a two dimensional space (between two variables, in this case), we get a straight line. 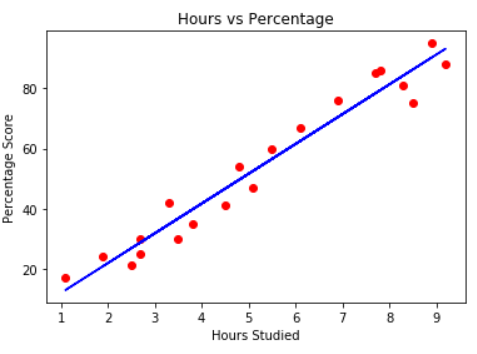 Let's consider a scenario where we want to determine the linear relationship between the numbers of hours a student studies and the percentage of marks that student scores in an exam. We want to find out that given the number of hours a student prepares for a test, about how high of a score can the student achieve? If we plot the independent variable (hours) on the x-axis and dependent variable (percentage) on the y-axis, linear regression gives us a straight line that best fits the data points, as shown in the figure below. Where b is the intercept and m is the slope of the line. So basically, the linear regression algorithm gives us the most optimal value for the intercept and the slope (in two dimensions). The y and x variables remain the same, since they are the data features and cannot be changed. The values that we can control are the intercept and slope. There can be multiple straight lines depending upon the values of intercept and slope. Basically what the linear regression algorithm does is it fits multiple lines on the data points and returns the line that results in the least error. This is the equation of a hyper plane. Remember, a linear regression model in two dimensions is a straight line; in three dimensions it is a plane, and in more than three dimensions, a hyper plane. In this section we will see how the Python Scikit-Learn library for machine learning can be used to implement regression functions. We will start with simple linear regression involving two variables and then we will move towards linear regression involving multiple variables. In this regression task we will predict the percentage of marks that a student is expected to score based upon the number of hours they studied. This is a simple linear regression task as it involves just two variables. Note: As you may have noticed from the above import statements, this code was executed using a Jupyter iPython Notebook. Note: This example was executed on a Windows based machine and the dataset was stored in "D:\datasets" folder. You can download the file in a different location as long as you change the dataset path accordingly. In the script above, we use plot() function of the pandas dataframe and pass it the column names for x coordinate and y coordinate, which are "Hours" and "Scores" respectively. 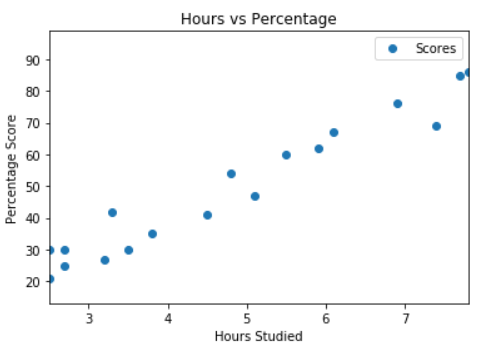 From the graph above, we can clearly see that there is a positive linear relation between the number of hours studied and percentage of score. The attributes are stored in the X variable. We specified "-1" as the range for columns since we wanted our attribute set to contain all the columns except the last one, which is "Scores". Similarly the y variable contains the labels. We specified 1 for the label column since the index for "Scores" column is 1. Remember, the column indexes start with 0, with 1 being the second column. In the next section, we will see a better way to specify columns for attributes and labels. The above script splits 80% of the data to training set while 20% of the data to test set. The test_size variable is where we actually specify the proportion of test set. With Scikit-Learn it is extremely straight forward to implement linear regression models, as all you really need to do is import the LinearRegression class, instantiate it, and call the fit() method along with our training data. This is about as simple as it gets when using a machine learning library to train on your data. In the theory section we said that linear regression model basically finds the best value for the intercept and slope, which results in a line that best fits the data. To see the value of the intercept and slop calculated by the linear regression algorithm for our dataset, execute the following code. The resulting value you see should be approximately 2.01816004143. The result should be approximately 9.91065648. This means that for every one unit of change in hours studied, the change in the score is about 9.91%. Or in simpler words, if a student studies one hour more than they previously studied for an exam, they can expect to achieve an increase of 9.91% in the score achieved by the student previously. The y_pred is a numpy array that contains all the predicted values for the input values in the X_test series. The values in the columns above may be different in your case because the train_test_split function randomly splits data into train and test sets, and your splits are likely different from the one shown in this article. Luckily, we don't have to perform these calculations manually. The Scikit-Learn library comes with pre-built functions that can be used to find out these values for us. You can see that the value of root mean squared error is 4.64, which is less than 10% of the mean value of the percentages of all the students i.e. 51.48. This means that our algorithm did a decent job. In the previous section we performed linear regression involving two variables. Almost all real world problems that you are going to encounter will have more than two variables. Linear regression involving multiple variables is called "multiple linear regression". The steps to perform multiple linear regression are almost similar to that of simple linear regression. The difference lies in the evaluation. You can use it to find out which factor has the highest impact on the predicted output and how different variables relate to each other. In this section we will use multiple linear regression to predict the gas consumptions (in millions of gallons) in 48 US states based upon gas taxes (in cents), per capita income (dollars), paved highways (in miles) and the proportion of population that has a drivers license. The first two columns in the above dataset do not provide any useful information, therefore they have been removed from the dataset file. Now let's develop a regression model for this task. This means that for a unit increase in "petroltax", there is a decrease of 24.19 million gallons in gas consumption. Similarly, a unit increase in proportion of population with a drivers license results in an increase of 1.324 billion gallons of gas consumption. We can see that "Averageincome" and "Paved_Highways" have a very little effect on the gas consumption. You can see that the value of root mean squared error is 60.07, which is slightly greater than 10% of the mean value of the gas consumption in all states. This means that our algorithm was not very accurate but can still make reasonably good predictions. Need more data: Only one year worth of data isn't that much, whereas having multiple years worth could have helped us improve the accuracy quite a bit. Bad assumptions: We made the assumption that this data has a linear relationship, but that might not be the case. Visualizing the data may help you determine that. Poor features: The features we used may not have had a high enough correlation to the values we were trying to predict. In this article we studied on of the most fundamental machine learning algorithms i.e. linear regression. We implemented both simple linear regression and multiple linear regression with the help of the Scikit-Learn machine learning library. Download and play with some other regression datasets to see what kind of results you can get out of those. The more experience the better! Have you used Scikit-Learn or linear regression on any problems in the past? If so, what was it and what were the results? Let us know in the comments!